WEAPONS ARE HONED FOR THE APRILIA RACING TEAM, MELANDRI AND GUINTOLI ARE READY TO TAKE THEIR RSV4s TO THE TOP. 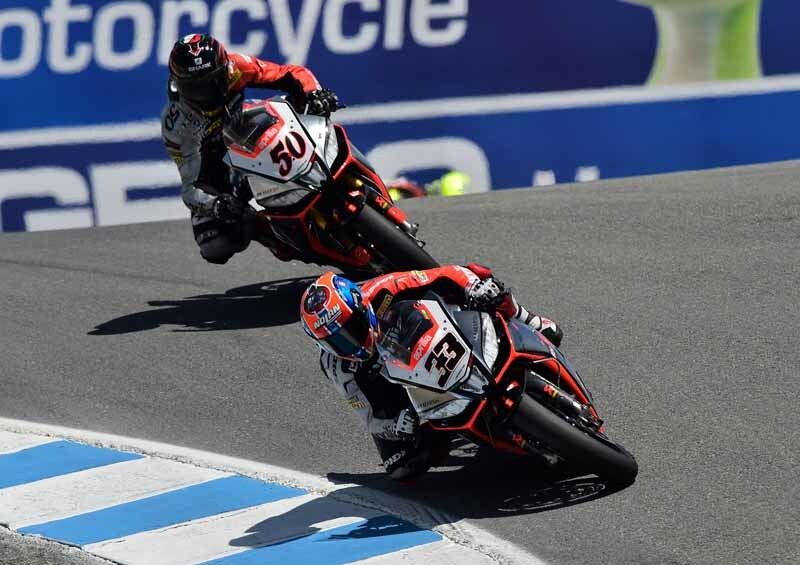 Noale, 3 September 2014 – After a rather long summer break the World Superbike engines roar to life once again, ready to take to the track in Jerez for the tenth round of the season. The abbreviated calendar, with the cancellation of the Russian and South African rounds, makes the battle even more heated for the Aprilia Racing Team. Sylvain Guintoli and Marco Melandri are determined to finish out the 2014 season with a bang. They will be able to cont on the experience they have accumulated at Jerez, the test track from the Italian team, and on the great harmony they have demonstrated with their RSV4s in recent rounds. Sylvain Guintoli, lying second in the rider championship standings, stayed fit during the break after the Portimão tests, taking advantage of the time to exercise his reflexes at Mallory Park astride a factory RSV4. For the French rider the goal is to battle in every race from here to the end of the championship, picking up as many points as possible: “Long summer break but the focus is 100% on performing at best in Jerez. Every race and every point will be fought for, even more now that South Africa has been cancelled. We can still do it”“E’ stata una pausa estiva piuttosto lunga, ma sono concentrato al 100% per dare il meglio a Jerez. Combatterò in ogni gara per ogni punto possibile, a maggior ragione ora che è stata cancellata la gara in Sudafrica. Ce la possiamo ancora fare, lotteremo fino alla bandiera a scacchi”. New father Marco Melandri also found a way to keep the sporting tension honed, having fun on a street RSV4 at Castelletto and Adria. A protagonist in recent races, the champion from Ravenna is keen to continue fighting for victory even if Jerez promises to be a heated battle: “We are finally getting back on the track. The break was definitely too long! This is going to be a heated weekend considering the temperatures and two very taxing races. Jerez is one of my favourite tracks. I can’t wait to feel that rush of adrenaline at the start. After winning the last round at Laguna Seca I’m sure that I’ll be confident and when I’m on my RSV4 I really have a lot of fun”.